Qatar's Al Jazeera Channel said on Monday Egyptian security forces have arrested three of its journalists following Interior Ministry accusations of illegally broadcasting from a hotel suite. Egypt's Interior Ministry said only two Al Jazeera reporters had been arrested. In a statement that did not identify names, the Interior Ministry said police had arrested a member of the "terrorist" Muslim Brotherhood movement as well as an Australian journalist who works for Al Jazeera and confiscated their equipment, including video cameras and two broadcast transmitters. "The National Security received information that a member of the [Brotherhood] organisation used two suites in a Cairo hotel to hold meetings with other members of the organisation and turned the suites into a press centre," the Interior Ministry said. "[They] made live broadcasts of news that harms domestic security, spreading rumours and false news to the Qatari Al Jazeera channel without permits," the statement continued. "Correspondent Peter Greste, producer Mohamed Fahmy and cameraman Mohamed Fawzy are being held in custody, having been arrested by security forces Sunday evening," Al-Jazeera English-language website said early on Monday. A source in the Qatari-based station told Ahram Online that Fahmy and Greste had been taken in from a hotel in Cairo's upscale Zamalek district, while cameraman Fawzy was apprehended from his home in eastern Cairo. The three are now being held in detention headquarters downtown, the Al Jazeera source added. 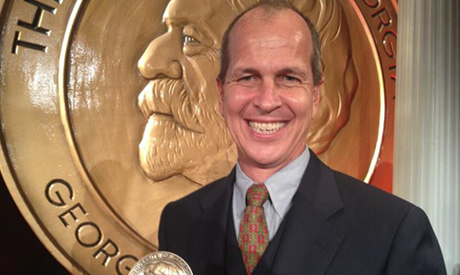 Greste, whom Al Jazeera described on Monday as "a veteran journalist who previously worked with Reuters, CNN and the BBC", is the recipient of the 2011 Peabody Award for a documentary on Somalia. Fahmy, who formerly worked with CNN, is now the head of Al Jazeera International office in Cairo. The only Al Jazeera-affiliated channel to have been banned with a court order is Al Jazeera Mubashir Misr, while all other sub-channels have been closed without one. Launched weeks after the ouster of former president Hosni Mubarak and widely perceived as the voice of the Brotherhood, the channel operated for over two years without accreditation. The channel network, which now broadcasts from Qatar and can still be viewed in Egypt, was accused by authorities and local media of biased coverage in favour of Morsi's Brotherhood. The new arrests come days after Egypt's authorities designated the Brotherhood a "terrorist organisation" after the suicide car bombing of a police headquarters that killed 16 people in Mansoura. A radical Islamist militant group based in Sinai claimed responsibility for the attack, which the Brotherhood had condemned and denied any connection to. At least two other Al-Jazeera reporters remain in custody since their arrests months ago. They include Al Jazeera Mubashir Misr correspondent Abdullah El-Shami -- who was arrested on 14 August when police forcibly dispersed a pro-Morsi protest camp in Cairo and cameraman Mohamed Badr, detained since July after his arrest during clashes in downtown Cairo on charges of violence and thuggery. The New York-based Committee to Protect Journalists (CPJ) has listed Egypt among the 2013 top 10 worst jailers of journalists. The top three were Turkey, Iran and China. A report issued last week showed that Egypt holds three other journalists in custody. What ever who you are or to which institution you belong the Egyptian security will get you if you participate in Egypt instability. Egypt is great and will not be defeeted by spredding Algazira Roomers and lies. Must be terrible to be sooo desperate to work for an outfit that backs terrorism at any cost. Peter time to wise up and reflect while you are in a cell serounded with brotherhood terrorists. Give my warm regards to Morsi . As an Aussie/Egyptian feeling so furious, this man is so well respected, worked for all leading broadcasters, and won prestigious awards......this is going too far, and now you will really upset the peaceful folks downunder!